Let's talk about the superdelegates. FHQ has largely steered clear of the topic of the unpledged delegates within the Democratic presidential nomination process for a very simple reason. The convention resolution that created the Unity Reform Commission (URC) in the first place in the summer of 2016 really tied the hands of the commission with a specific recommendation the group had to make to the DNC Rules and Bylaws Committee.1 Given the language of that section of the resolution, the question has always been over whether the commission would stick with that specific recommendation or go beyond it (while still fulfilling the mandate). This is a point FHQ has hammered since the convention and on social media in the time since. Most significantly, Huynh said that there is agreement within the unpledged delegates working group that the role of superdelegates is due for both revision and reduction within the presidential nomination process, but went on to concede that the mandate for what the commission is to do on the topic is clear. Huynh went on to say that the work ahead was about "working out the kinks" and "logistics". Looking at that, there is not much that wanders very far from the binary choice mentioned above with respect to superdelegates and 2020. Again, that is resolution mandate or mandate and more. However, Flores later augmented her commentary on the progress of the unpledged delegates working group in an interview with The Young Turks. There, Flores points to a possible third -- yet to be determined (thus the "working" group) -- option on superdelegates. No, the pointing Flores did was not emphatic, but what is is that both the unpledged delegates working group and the URC are not all that enamored of the language on the superdelegates section of the resolution that created the commission. Its specificity limits what the group can accomplish in reexamining the role of superdelegates in the process. And all of this comes full circle right back around to the "logistics" on which the subgroup is working. To be clear, this does not mean that the working group or the URC are nefariously trying to "get out" of that section of the resolution. Rather, the goal would be to devise an option different than that set out in the resolution while staying true to the intent: revising and reducing the role of the superdelegates. It is that point on which there is agreement on the commission after all. With the time between now and the final URC meeting on December 8-9 -- the one where voting on recommended changes will be done -- ticking away, where does all of this go with respect to unpledged delegates? Does the group stick with the mandated recommendation, go beyond it, or find some alternate path? The answer hinges on a number of factors that I would file into three main categories. The main "logistical" issue cited in the comments of the unpledged delegate working group conveners was the two classes of superdelegates that the mandate creates: a group of unpledged, unfettered elected officials and a group of pledged party leaders. FHQ will delve into a part of the history of superdelegates here before circling back to the main point of this section. Bear with us or scroll on down to the paragraph beginning "FHQ will deal...". Some argued that the 1972 and 1976 conventions had contained too many “amateur” delegates who had little understanding of the necessary qualities for successful presidential candidates. Others argued that exclusion of mainstream Democrats prevented presidential nominees from building coalitions that were necessary for winning the election or governing effectively. Now, there no doubt will be those who would contend that the rank-and-file members of a party do not need the party establishment to tell them what the "necessary qualities for successful presidential candidates" are. And that point would be well taken. However, the Democrats of the 1970s were still after not only an overarching set of delegate selection rules that would produce a winning presidential candidate, but one who could govern effectively as well. One concept that has made its way into the Unity Reform Commission discussion of superdelegates that was also often used in similar meetings in the 1970s is that of "peer review". In other words, there would be a faction of delegates that could provide that point of view at the convention. But the first attempt at adding that point of view for the 1980 cycle fell short. The 1978 Winograd Commission had boosted each state delegation by ten percent with the express purpose of providing pledged delegate slots to party leaders and elected state officials (PLEOs). This had the effect reducing competition for the at-large and district delegate slots. Activists, grassroots organizers and others did not have to run for those positions against those PLEOs with better name recognition. Alternatively, it removed a negative incentive for PLEOs: They did not have to run against their constituents for those spots, something most were loath to do. After all, those rank-and-file most likely to run for delegate positions are the same who are most likely to volunteer for and/or donate to reelection efforts of those officeholders. Those were the positives of the Winograd Commission addition of PLEO delegates for the 1980 cycle. But those changes missed the mark in terms of peer review. The number of party leaders and elected officials delegates actually decreased in 1980 relative to 1976 and that was most acute among members of Congress, those perhaps best equipped to judge the qualities of a potential partner in the executive branch. It was there that the Hunt Commission began in 1982; again attempting to provide for robust peer review to complement the voice of rank-and-file party members filtered through primary and caucus voting. To bridge the gap between the perceived shortcomings of the Winograd Commission rules and the need to get more PLEOs involved in the process, the Hunt Commission reversed the 1972 era ban on automatic delegates but also made the 568 new delegate positions for DNC members and some members of Congress unpledged. The former -- the ban reversal -- addressed the participation issues for members of Congress while the latter -- their unpledged status -- returned, in the words of the Hunt Commission report, "decision making and flexibility to the convention." FHQ will deal with most of the issues with that decision in section two below, but the important factor here in light of the "two classes" complaint is that the context was much different in 1982. The DNC not only saw the need for peer review, but foresaw that process happening after the voting and at the convention. Those were the considerations that became the the very foundation of this two classes distinction. A generation later, though, the process functions differently than intended, and there are two groups of delegates treated differently in terms of how they function. But the baseline recommendation the URC is to make to the Rules and Bylaws Committee based on the group's charter does not really remedy that issue. In fact, as unpledged delegate group convener, Lucy Flores, basically argued in Las Vegas, it perpetuates the two classes problem while shrinking one of those classes. Actually, it creates a third class of delegates when one fully considers the relevant dimensions of this. The pledged at-large, district and PLEO delegates remain as do the unpledged national elected officials and distinguished party leaders (i.e. : former presidents, former speakers of the House, etc.). But the DNC members who would be shifted into the pledged category do not so neatly fit in with the rest. The answer is twofold. Part of it lies in the process the URC resolution creates. Those DNC members would be, in the words of the resolution, required to cast their vote at the Convention for candidates in proportion to the vote received for each candidate in their state. They would be bound. Now, the Republican Party does this. The last two Republican conventions have had heated discussion over the issue. But the secret of the Democratic process is that the delegates are not bound. They are pledged. They are pledged to a candidate but are free within the context of the convention to vote for whichever candidate they please. What kept, for example, delegates in Bernie Sanders' corner at the 2016 Democratic convention despite the fact that he could not win the nomination was loyalty. But that loyalty was borne of the process by which those delegates were selected. Sanders won the delegate slots in primaries and caucuses and filled those slots with loyalists from his slate of delegate candidates. And lacking a full slate or enough candidates to fill those slots, the Sanders team had the right of review over who filled them (if filled by the state or district party). Those delegates are not bound, but are the folks least likely to stray from their candidate in a competitive convention environment. The treatment of the DNC members would be different than both those pledged delegates and the unpledged superdelegates. They would be bound, not pledged. And they would be bound because, unlike the other pledged delegates, they could not be replaced by the candidates or would ostensibly lose their DNC positions in order to be replaced.5 But that is a treatment different than the two other types of delegates that potentially creates unintended consequences. No matter how one cuts it, there will almost always be different classes of delegates, super- or otherwise, on some level so long as the national party continues to place value on trying to maintain both instructed delegates and enlightened trustees involvement in the process. But creating a new class of delegates is something with which the URC and later the Rules and Bylaws Committee will have to wrestle. Having established the context for the addition of superdelegates in the previous section, it is additionally worthwhile to look at the evolution of that group of delegates for some hints about any potential alternate paths the URC may consider, one divergent from the superdelegates resolution. It is often easy to assume that the group of superdelegates in the Democratic presidential nomination process has been mostly static over time. Add Democratic members of Congress to DNC members and that equals superdelegates. That, of course, is an oversimplification of the equation now and historically. The number of superdelegates has evolved over time as has their share of the overall national convention. Let's revisit the 1984 cycle. To reiterate, this was the cycle that unpledged superdelegates became a part of the system, added by the 1982 Hunt Commission to provide what was and has in the time since been called peer review at the convention. But fighting the battles of the previous cycles to right the ship for the future often lays the groundwork for unintended consequences. That was the case in this instance. The original idea was to create a group of unpledged delegates that would equal 30 percent of the total number of delegates to attend the 1984 convention. By the time the delegate selection rules had been finalized for 1984, that number had been cut by more than half to around 14 percent. But the emerging method of determining who was a superdelegate was much more complicated than was the case in 2016. The 568 superdelegate slots in 1984 were reserved first for state party chairs and vice chairs. The remaining approximately 400 positions were granted to the states and the Democratic conferences in Congress. States received a number of slots equal to the sum of Democratic members of Congress, governors and big city mayors. However, those spots were not necessarily reserved for members of Congress, governors and big city mayors. State parties could fill them how they pleased with, for example, DNC members from the state and/or other party leaders and elected officials not filling the pledged PLEO positions in state delegations. If that was not complex enough, the formula also granted the Democratic conferences in Congress the ability to choose 60 percent of their members to be unpledged as the final piece to the original superdelegate puzzle. Now, the addition of these unpledged delegates was controversial as it stood. Yet, in practice, the selection itself, particularly of those congressional superdelegates, became separately contentious during and following primary season in 1984. And the reason was not dissimilar to what occurred in 2016. Early in 1984, before Iowa and New Hampshire voted, the Democratic conferences selected 60 percent of their members to be unpledged delegates to the national convention. But while still unpledged, the vast majority of those selected had a public preference for Mondale. That selection served as an unofficial and unintended first contest in the 1984 Democratic nomination race. Again, the Hunt Commission report had seen the addition of these delegates as adding more deliberation to the convention, not less to the progress of primary season. The parallel is imperfect, but like the Sanders campaign during 2016, the Jesse Jackson and Gary Hart campaigns saw the early activity of superdelegates in 1984 as problematic. After primary season in 1984, Jackson surrogates argued for the elimination of superdelegates while Hart proxies pushed for a reduction of their share relative to the total number of delegates to the national convention (Southwell 1986). Of course, there were those who argued for the preservation of unpledged delegates moving forward. The byproduct of the back and forth for 1988 was a streamlining of the superdelegate process. First, the "who" of the superdelegates was simplified. Specific groups were granted unpledged status: DNC members, Democratic governors, distinguished party leaders and 80 percent of the congressional Democrats. Not only was that percentage of Democratic members of Congress raised, but a window was created between late April and early May for selecting them. That addressed a lingering issue from the 1984 cycle, pushing the selection back to a point well after the beginning of primary season voting. However, rather than reduce the number of superdelegates, those changes for the 1988 cycle slightly increased their number. And that was generally the trajectory of change through the 2008 cycle; what was later referred to as "superdelegate creep" during the proceedings of the post-2008 Democratic Change Commission. That interim period saw the superdelegate share of the total number of delegates rise for a variety of reasons; a trend made clear in the chart below. Some were more benign than others. Obviously there is some variation in the number of Democrats who hold elective office at the federal level, but the position of Democrats in Congress or in gubernatorial positions ebbed and flowed over the course of the period in question. There was also a broadening of the distinguished party leader category of unpledged delegates. Former presidents and vice presidents were included in that group from the start, and it expanded in fits and starts over time to include not only former Democratic speakers of the House and Senate majority leaders, but former minority leaders as well. Later, this was expanded to former DNC chairs and sitting presidents and vice presidents. Again, though, these were not changes that significantly altered the superdelegate share. All of this created an increasing share of superdelegates over time. But that was a period that witnessed neither the type of deliberative conventions the Hunt Commission had hoped for, nor superdelegates playing an outsized role in those nomination contests. That changed in and after 2008, prompted by the intensely close Clinton-Obama nomination battle. Not since 1984 had superdelegates and their role in the process been in the spotlight in the way each was in 2008. That was enough to put the role of unpledged delegates on the agenda of the Democratic Change Commission, the post-2008 group tasked with reexamining the nomination process and rules. Typically, the modus operandi of any party following a successful capture (or recapture) of the White House is to maintain the status quo in the nomination process. Newly nominated/elected presidents tend to like the process that got them into office. That leads to subtle if any changes. And that was mostly true after 2008. However, one of the largest changes for 2012 was to the superdelegates system; to counteract the slow, but ever increasing share of unpledged delegates in the process. And that change, too, is clear in the figure above. 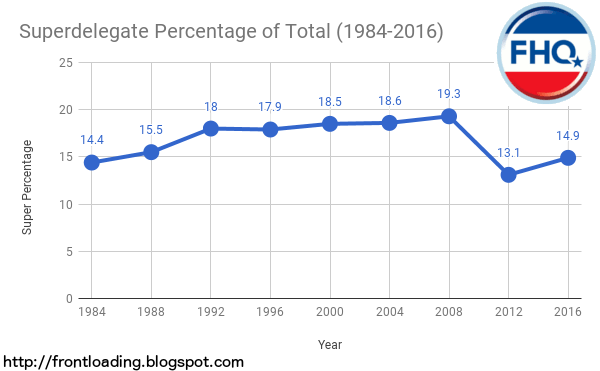 That substantial drop from a superdelegate era high point of 19.3 percent in 2008 to a low point -- lower than the original share of superdelegates in 1984 -- in 2012 of 13.1 percent is attributable to a couple of factors. One is that the add-on category was eliminated.7 But the decrease in 2012 is greater than the increase due to the add-ons in 1992. The other main factor differs from those above. All of those affected the numerator in the superdelegate share equation. The denominator also can change and did for 2012. From 1988-2008 the baseline number of delegates in the Democratic delegate apportionment formula was 3000. That was increased for 2012 to 3700, an uptick nearly equivalent to the overall number of superdelegates. But when that denominator increases the resulting share of superdelegates decreases. Practically speaking, those add-on spots were shifted from the unpledged to pledged area. This evolution since 1984 does offer some potential courses of action for the Unity Reform Commission if the group is looking for ways to uphold the intent of the superdelegate section of the resolution, but alter in some ways the language and implementation. On its surface that resolution redoubles efforts to curb the influence of superdelegates. It echoes the 2012 change eliminating the add-on delegates (and shifting of them in to the pledged category). However, as was described in the first section above, such a move to shift DNC members into the pledged category does create some issues that would require further discussion if not rule-making to properly implement. However, such a change, if ultimately recommended and passed, makes more sense than reintroducing an unnecessarily complex cap on the percentage of Democratic members of Congress who can be selected as unpledged delegates. That does not appear to be a road the DNC would be willing to tread again. One could argue that the pledging of members of the Democratic National Committee is not the highest priority of those who were superdelegates detractors in 2016. Indeed, considering how by the end of March 2016 the Sanders campaign was openly discussing a plan to persuade superdelegates to switch allegiances, there does seem to be at least some acceptance of them. Granted, acceptance then does not equate to acceptance now. However, that strategic shift does point toward a hierarchy of superdelegate grievances. The issue was less that those delegates were unpledged -- only that could allow a switch of preferences -- but the timing of the public announcement of the initial presidential preference. As in 1984 with the selection of congressional superdelegates, the primary unpledged delegate issue in 2016 was that the public preferences of some gave a decided advantage to one candidate in the delegate count before any votes had been cast. The answer after 1984 was to create a window deep enough into the calendar in which congressional superdelegates could be selected and not give any candidate a pre-vote advantage. Adapting a similar method for 2020 could accomplish the same goal. The idea is less to reduce the role of superdelegates and more to reduce the pre-primary role of superdelegates by prohibiting DNC member endorsements before a certain point/window on the calendar, until their home states have voted, or until primary season is complete. Many superdelegates have waited until those latter two points in past cycles. Such a move would circumvent the replacement and additional rules-making issues attendant to the current resolution -- as described in the first section -- while eliminating the largest of the superdelegates problems from 2016. And by delaying the endorsements of DNC members, especially if until the convention, maintains some consistency with the original intent of the Hunt Commission, a more deliberative and flexible convention (if the nomination remains unresolved at that point). Now, if one were to handicap this and attempt to put odds on the likelihood of something other than the current superdelegate resolution being recommended to the Rules and Bylaws Committee, then one need look no further than the formation of the URC itself. This is a group almost engineered to deadlock on the most controversial items before them. And that is especially true for anything that reanimates the Clinton-Sanders fault lines. The superdelegates issue hits that mark, but so too do the items in the other so-called buckets. This is a group almost designed to create narrow and likely small changes -- at least compared to what some on the fringes of both sides seem to want out of this process -- to the 2020 delegate selection rules. But that is precisely what makes how concrete the requirements of the superdelegates part of the resolution so important. Therein lies a recommendation the Unity Reform Commission has to make. If the narrowly divided group cannot agree on an alternative, then that is the recommendation that will make its way to the Rules and Bylaws Committee. In the end, it is easy to be against something (like this resolution or the superdelegates system for that matter), but harder to come up with a passable alternative. That is all the more true given some of the complexities involved. That the Unity Reform Commission shall consider and make appropriate recommendations for revisions to the Delegate Selection Rules for the 2020 Democratic National Convention to provide for a change in the manner by which unpledged party leader and elected official (PLEO) delegates participate in the presidential nominating process. In particular, the Commission shall make specific recommendations providing that Members of Congress, Governors and distinguished party leaders (DNC Charter Art. Two, Section 4(h)(ii)(1)-(6)) remain unpledged and free to support their nominee of choice, but that remaining unpledged delegates be required to cast their vote at the Convention for candidates in proportion to the vote received for each candidate in their state. 2 Convener is the term used by the URC for leaders of the four working groups (unpledged delegates, caucuses, primary/participation and party reform). Like the commission leadership structure, there is a Clinton-appointed and a Sanders-appointed convener for each subgroup. 3 Flores continued that grassroots voices/unpledged delegates in the party are the most important and should not be treated as lesser than those of other delegates. 4 Of course, given the rules tinkering that has become customary every four years, one could argue that the search for "just right" is never-ending. And considering that new problems are raised with new conditions in different cycles it is. However, it is more maintenance now than it was in the early days immediately post-reform. The two 1970s cycles and even 1980 were less maintenance and more about an attempt at developing a working nomination system. 5 It would take an additional bit of rule-making to bring this enforcement/replacement into being. But it would be a necessary addition to the superdelegates provision in the resolution to create some basic functionality. 6 Interestingly, the expansion of congressional superdelegates from 80 percent to 100 percent was offset between 1992 and 1996 by the loss of Democratic seats in Congress in 1994. The combination had the effect of reducing the total share of superdelegates in 1996 relative to four years previous. 7 It should also be noted that Democrats lost seats in Congress and gubernatorial positions in 2010, reducing the number of superdelegates in 2012. But that change was slight compared to the other tweaks to the superdelegates rules.